HomeAway certainly would be an attractive acquisition for companies with deep pockets such as Priceline, TripAdvisor, Expedia and Google. On the down side, HomeAway is in the midst of very difficult changes as it tries to get e-commerce-enabled, and is in the throes of changing its business model from subscriptions to pay-per booking. 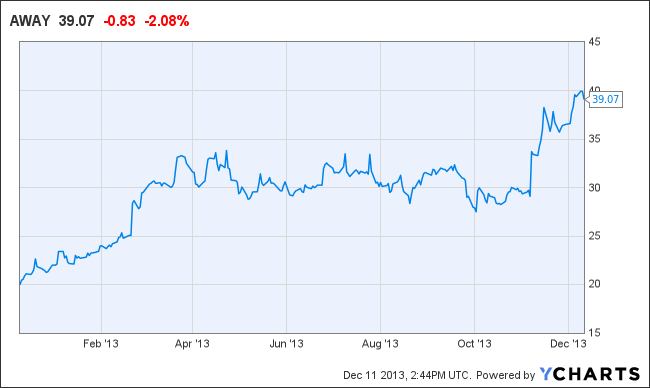 Still, it’s probably better to acquire HomeAway now before it gets even more expensive. HomeAway Inc.’s rising online vacation rental bookings may persuade suitors to tackle the most expensive Internet deal since 2007 as an improving economy spurs a rebound in travel. With listings for more than 700,000 homes around the world, analysts estimate that HomeAway will boost sales by about 65 percent in three years. Revenue for all U.S. travel agencies is poised to rise as economic conditions improve, with growth from online booking sites seen fueling the gains, according to IBISWorld Inc. As Priceline.com Inc., Expedia Inc. and TripAdvisor Inc. eye opportunities in vacation rental services, HomeAway may entice takeover interest, Cowen Group Inc. said. After surging 81 percent this year, HomeAway traded yesterday at 10.3 times its sales, already a higher multiple than any public Internet company has commanded in a takeover in the last six years, according to data compiled by Bloomberg. While the $3.4 billion company faces competition from rivals such as Airbnb Inc., Piper Jaffray Cos. said HomeAway’s dominant position in the growing online vacation rental market makes it worth the price for potential suitors. Even Google Inc. could be interested in a deal, according to Canaccord Financial Inc.
Victor Wang, a spokesman for Austin, Texas-based HomeAway, said it had no immediate comment. HomeAway yesterday said the company and some shareholders plan to sell about 6 million shares in a secondary offering. HomeAway, which went public in 2011, has the largest portfolio of vacation rental properties in the world, with residences in countries from Madagascar to Brazil. Other sites owned by the company include VacationRentals.com and VRBO.com. Kevin Kopelman, a New York-based analyst at Cowen, estimated HomeAway controlled as much as 15 percent of the approximately $100 billion U.S. and European vacation rental bookings market. The company has relied on upfront fees charged for home listings to make money. It’s now testing a pay-per-booking option with a 10 percent commission rate to attract property owners and managers reluctant to may payments prior to rentals. While the entrance of competitors such as Airbnb has pressured new listings growth, HomeAway’s large customer base and focus on high-end homes with more expensive room rates gives it an advantage in bookings, Kopelman wrote in an Oct. 28 report. Revenue at HomeAway is poised to top $560 million in 2016, up from $280 million in 2012, according to the average of analysts’ estimates compiled by Bloomberg. Bookings should increase from an estimated $9.3 billion this year to almost $19 billion in 2023, Kopelman forecast. Given HomeAway’s market-leading position, “there is a meaningful possibility the company could be an acquisition target,” with Priceline, Expedia, TripAdvisor and other Internet companies potentially weighing a stronger presence in vacation rentals, the analyst wrote. TripAdvisor subsidiary FlipKey offers online vacation rentals and Expedia announced an agreement in October to showcase HomeAway properties. Consumers want to be able to book flights and travel accommodations, whether a hotel or a home, on one site, said Olson of Piper Jaffray. Rather than take the time to build up their own rental listings, TripAdvisor, Expedia and Priceline may bid for HomeAway to absorb its inventory, he said. A search engine provider such as Google also could be interested in acquiring HomeAway to enhance user searches and maps with the company’s rental data, said Michael Graham of Canaccord. It would be similar to Google’s 2011 purchase and integration of restaurant-guide publisher Zagat Survey LLC, he said. “It’s one type of combination that might make sense,” the New York-based analyst said in a phone interview. “The overarching justification for it would be a big search player trying to make” searches more detailed, relevant and comprehensive. While HomeAway likely prefers to grow on its own, it lacks a “super brand” and operates several travel sites with different names, Graham said. A powerhouse like Google may help lure more traffic, he said. A representative for Norwalk, Connecticut-based Priceline didn’t respond to a request for comment. Representatives for Newton, Massachusetts-based TripAdvisor, Bellevue, Washington- based Expedia and Mountain View, California-based Google declined to comment when asked whether their companies would be interested in buying HomeAway. While HomeAway would be an appealing target for online travel sites such as Expedia or Priceline, suitors may prefer to hold off on a takeover until the company has made more of its inventory bookable online, said Jake Fuller, a New York-based analyst at FBR & Co. Currently, users have to pay the owner directly to book most properties on HomeAway’s site. “It’s not clear that HomeAway is yet ready to be fully integrated into the online travel agency inventory,” Fuller said. Buyers may also balk at the lofty valuation, he added. After its shares gained more than twice as much as the Russell 1000 Consumer Discretionary Index this year through yesterday, HomeAway already has a higher price-sales multiple than any public Internet company has fetched in a deal valued at more than $1 billion since 2007, according to data compiled by Bloomberg. HomeAway deserves a high multiple because of its “extremely strong” competitive position in online vacation rentals and steady revenue stream, said Olson of Piper Jaffray. Potential suitors will likely be willing to pay up to gain access to its inventory, he said. The company’s new pay-per-booking model, international expansion opportunities and a continuing consumer shift to the Internet for vacation rentals offers a path to even greater growth, said Graham of Canaccord. With assistance from Ari Levy in San Francisco. Editors: Beth Williams, Sarah Rabil. To contact the reporter on this story: Brooke Sutherland in New York at bsutherland7@bloomberg.net. To contact the editor responsible for this story: Sarah Rabil at srabil@bloomberg.net.